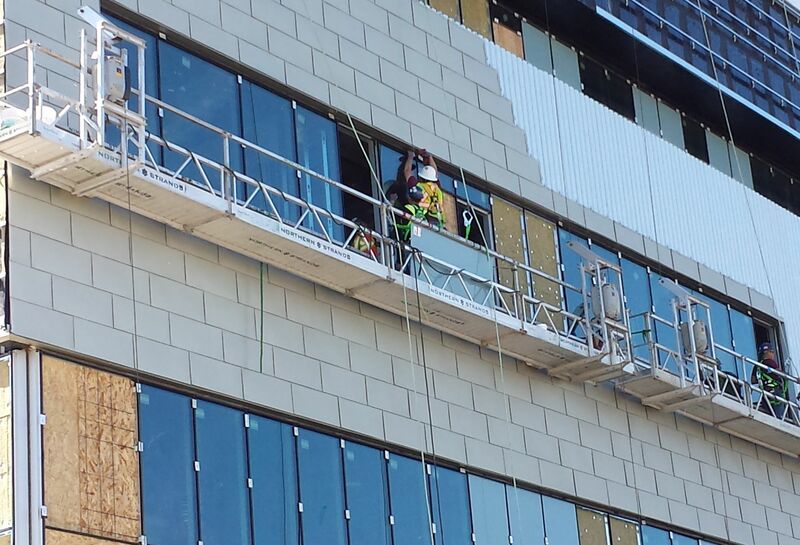 Northern Strands is currently working with multiple contractors on the new Children's Hospital in Saskatoon, where the footprint demands alternate solutions to scissor lifts and boom lifts. Aerial lifts are not always the solution. Swing Stage platforms are often times more economical than other access solutions. With no less than 10 Suspended Access work platforms on site in various configurations, here's proof that Northern Strands has the swing stage equipment and expertise to get you up to your elevated work areas. Think that Suspended Access Platforms only go straight up and down? Think again! 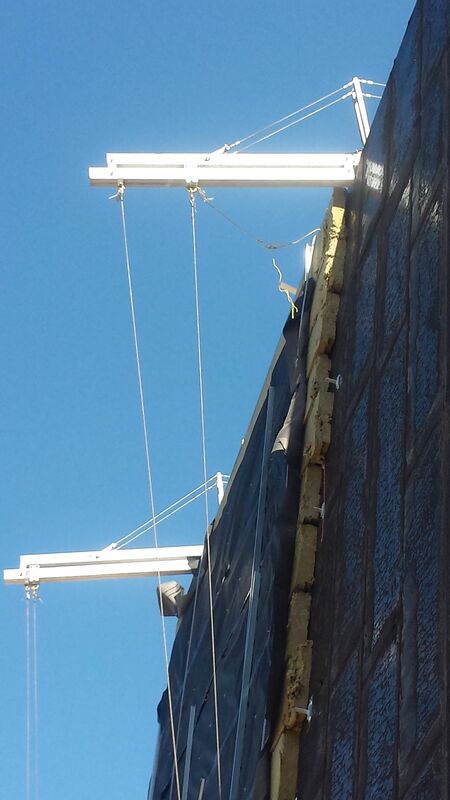 Northern Strands also installed this unique rigging system (seen below), for an international contractor at the Children's Hospital construction site in Saskatoon. This contractor needed the elevated work platform to have the ability to move in and out in relation to the wall, as it was sloped in design. To complicate matters, the crowded footprint of this project did not allow for the use of boom-type man-lifts. With very little fuss, Northern Strands supplied extended reach outrigger beams that utilize a secondary rolling trolley system, which gave the contractor exactly the abilities they needed. This was not the first custom solution Northern Strands has provided to the multiple contractors on at the Children's Hospital.